Solgar Vitamin D is unique among essential nutrients, in that it transforms into a hormone in its active form. Like other hormones, it is responsible for regulating certain bodily functions. Once it is produced in the kidney, the active form of vitamin D triggers several essential processes. 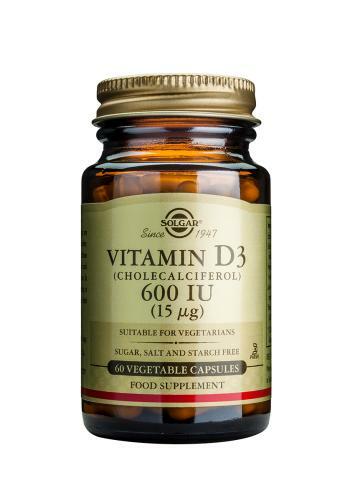 Studies suggest that cholecalciferol (D3) is the most bioavailable form of vitamin D, which has recently been the subject of renewed interest amongst nutritional scientists. A raft of new studies highlight the importance of Solgar vitamin D, not only in its traditional role in bone support, but also in areas including immune and mental health. As a food supplement for adults, one (1) vegetable capsule daily, preferably at mealtime, or as directed by a health care practitioner. Vitamin D3 (600 IU), as cholecalciferol 15mcg. The most important role of the fat-soluble vitamin D is maintaining blood levels of calcium, which it accomplishes by increasing absorption of calcium from food and reducing urinary calcium loss. Both effects keep calcium in the body and therefore spare the calcium that is stored in bones. When necessary, vitamin D transfers calcium from the bone into the bloodstream, which does not benefit bones. Although the overall effect of vitamin D on the bones is complicated, some vitamin D is necessary for healthy bones and teeth. Vitamin D plays a role in immunity and blood cell formation and also helps cells "differentiate" - a process that may reduce the risk of cancer. From animal and human studies, researchers have hypothesized that vitamin D may protect people from multiple sclerosis, autoimmune arthritis, and juvenile diabetes. Vitamin D is also needed for adequate blood levels of insulin. Vitamin D receptors have been found in the pancreas where insulin is made, and preliminary evidence suggests that supplementation may increase insulin secretion for some people with adult-onset (type 2) diabetes. PLEASE NOTE: If you are pregnant, nursing, taking any medication or have a medical condition, please consult your healthcare practitioner before taking any dietary supplement.